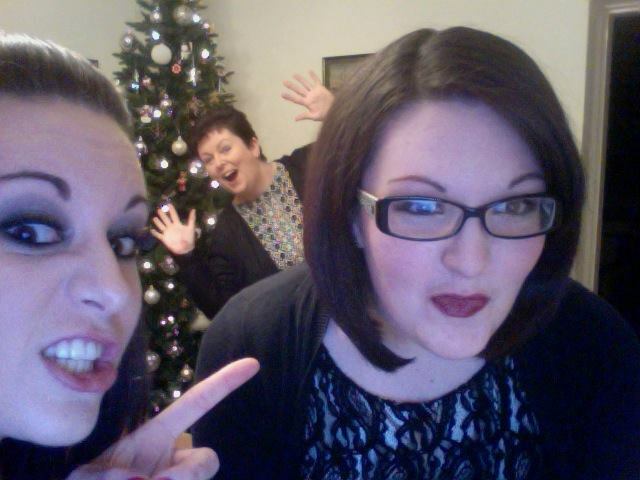 Apologies for the blurry photo but this is my absolute favourite Christmas photo from 2013 with my mum and sister. Can you imagine not knowing what Christmas is, being put into that situation and seeing regular people doing all sorts of extraordinary things? When you think about it, Christmas is weird. Here’s why. 1. We bring trees indoors. I’m 100% down with that delicious pine-y scent that you can only get from a scented candle in our house after my mum converted to a plastic tree. It’s the smell of Christmas (courtesy of a Yankee Candle in this case). But trees? Indoors? Weird. 2. We eat Quality Street. Think about it. This is the world’s shittest selection of chocolates which is why they only crop up once a year, and yet we still sit around and eat a whole tin until the weird chocolate block ones are left. 3. We get up stupidly early. I have heard that not everyone does this (if you don’t, you’re doing Christmas wrong) and some people actually sleep in but it is the only day of the year that it’s acceptable for my sister to come climb into my bed because she’s awake and excited at 6am. My sister is 24 years old. 4. We go for a walk near our own house. WHY?! At no other time of the year would you gather up your extended family and take them for a tour of the cul-de-sac, so why choose a day in December? 5. We send cards to people we don’t actually like. For everyone who had a sharp intake of breath and immediately thought ‘I love every person in my address book’, do not kid yourself. Credit to everyone who has to take out a second mortgage to afford the price of that many stamps, but come on, let’s save the trees instead of keeping up appearances. 6. We set fire to the dessert. Unless you’re particularly fancy and use one of those blow torches on Creme Brulee all year round, the fire hazard of pouring half a bottle of brandy over a Christmas pudding is 100% the highlight of Christmas dinner. 7. We drink, all day. Whilst this is actually acceptable all year round, especially whilst in a beer garden, on Christmas Day, it gets fancy. Bucks Fizz for breakfast, wine with lunch, perhaps a festive cocktail during the Queen’s speech and if you’re so inclined, a Bailey’s before bed. Bit of a step up from spending the afternoon outside the pub in August necking Rekorderlig, isn’t it? 8. We use it as excuse for absolutely everything. Don’t want to go to the gym? What’s the point, it’s nearly Christmas! Need a reason to go to the pub? It’s Christmas drinks! Want to buy yourself something you can’t afford? It’s a Christmas present (to me, from me and I’m having it before Christmas). Want an excuse not to see that friend you only ever see once a year? Sorry, Christmas is a time for family! I love Christmas. I love Christmas for all these weird reasons and I love that it brings people together and makes you appreciate what you have. I love the traditions, I love that in every household there’s some little quirk that makes that Christmas different from everyone else’s. If you happen to do anything particularly weird on Christmas day please let me know in the comments, I’d love to hear!